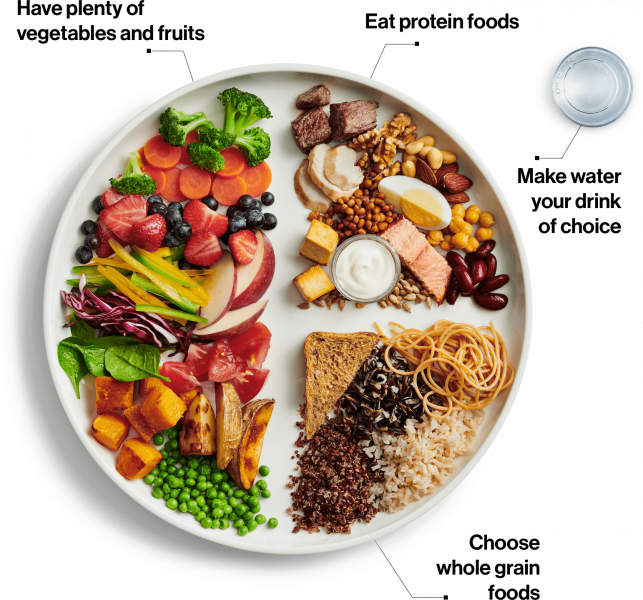 By now you’ve probably heard of the new Canada’s Food Guide, but if not here’s a recap, because it is wildly different than the old one you’re used to. The first thing you’ve probably noticed is that we have completely done away with the four food groups. Dairy doesn’t even have a place on the new Food Guide and has been completely replaced with even MORE fruits and vegeatbles (sorry kids). An interesting new facet of the new guide is “make water your drink of choice”. There was never any mention of liquids in the old, four food group version of the guide, except that you should always get in two to three servings of “milk and alternatives”, whatever that means. Another highlight in the new guide is “eating protein foods”, the first mention of macronutrients in the Food Guide. Whereas in the old guide it was broken into the four food groups, this section of the plate involves three of the groups: meats, cheeses, nuts and legumes, with fruits and vegetables getting their own half of the plate (still so sorry kids). Noting that you should direct yourself towards whole grain foods reinforces that you should be aiming for healthy fats instead of saturated fats. Though the old guide was laid out nice and simply: “eat x amount of vegetables, and x amount of meat and alternatives…” the new scientific approach to nutrition in the new guide is refreshing and informational. There are obviously more tips outside of the new guide that we should be following. To learn more about how the new guide was created, and other ways to help continue a healthy lifestyle, visit https://food-guide.canada.ca/en/guidelines/.